Ocean racing legend and skipper of Team Britannia, Alan Priddy has been given a top honour by the University of Portsmouth. 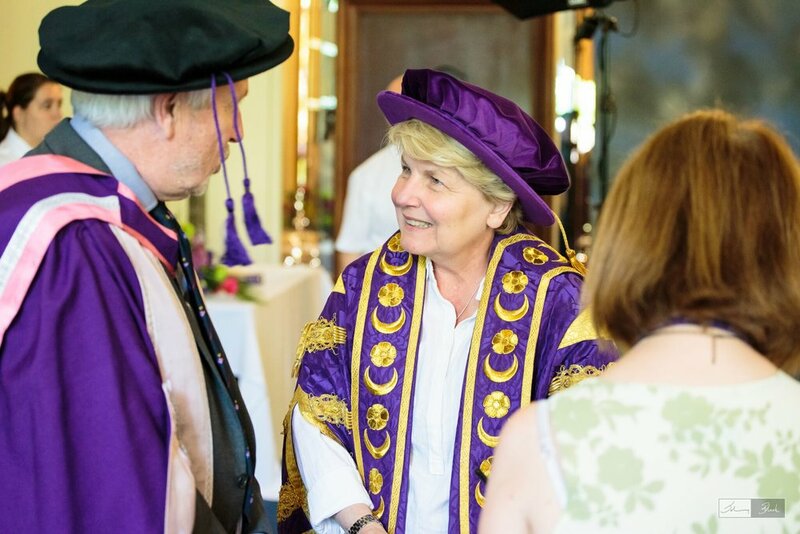 The award, Doctor of Science (honoris causa) was presented to Alan at a spectacular graduation ceremony in Portsmouth’s Guildhall, overseen by TV’s Sandi Toksvig – the Chancellor of the University. Speaking at the ceremony Professor Mike Tipton, praised Alan as a local boy who has “done good” and that just reeling off his achievements was “far from the whole story”. “Alan was born in Portsmouth, he was sailing by 8 years of age and in charge of a motorised dingy by the age of 11,” he said. “A few years later Alan had become a MOD (not a Rocker) and through the association with scooters, developed a passion for fixing them. This hobby turned into a small business when a friend, Pat Nelson, gave Alan access to a workshop in Fratton and he started fixing bikes, then cars. At the time he was also acting a labourer for six brick layers so focussing on things mechanical provably wasn’t that hard a choice! “Alan worked on all aspects of bikes and cars until one day one of his customers advised him to “Do one thing properly”. Alan heeded this advice and concentrated on gear boxes, building the specialist “Express Gearbox Company” which employs 25 people in Portsmouth and has customers around the globe. Alan was joined by his family and crew members for his latest adventure Team Britannia. the multi-million pound British bid to design and build the fastest and most fuel efficient semi-wave slicing powerboat to circumnavigate the globe. Professor Tipton continued: “Amongst his early non-sailing challenges Alan canoed and rowed around the Isle of Wight. He undertook his first challenge in a rigid–hulled inflatable boat (a RIB) in 1990 when he set a record for a journey around Scotland in a 15 foot boat. Several record-breaking journeys followed around Britain (1992), Ireland (1993) and in the Bay of Biscay (1996). “Alan was 2nd in the 1993 Round Britain RIB challenge, and then in 1997, he attempted the Atlantic Challenge in a 24 foot RIB. The route went from Portsmouth, New Hampshire in the USA to Portsmouth, Hampshire, stopping on the way in Nova Scotia, Newfoundland, Greenland, Iceland and Northern Ireland. Luckily Alan is “fascinated by ice” because he was blocked by it, and found himself in an open boat, 500 miles from safety with 100 miles-worth of fuel on board. He waited 5 days for an ice-breaker and, 21 days after he set-off, he made it to Portsmouth. “Further RIB challenges and records followed: London to Monaco in 99 hours and 19 minutes; the Circumnavigation of Britain in five days, six hours and five minutes. In 2002 Alan, Clive Tully, Alan Carter and Steve Lloyd attempted to circumnavigate the globe in the custom-built RIB Spirit of Cardiff, one of the largest RIBs in the world at the time with an overall length of 33 feet. But the voyage ran into difficulties and was prematurely concluded when one of the crew suffered heart problems 350 miles from Newfoundland. “In 2003, Alan attempted to cross from St. John's, Newfoundland to Cape Wrath in Scotland in less than 100 hours. The Spirit of Cardiff was refurbished and became The Jolly Sailor. A gruelling voyage ensued with the boat being battered by 50 knot winds. Despite this Alan set the fastest transatlantic crossing by a RIB. In 2004, Alan attempted to return the Jolly Sailor to Newfoundland to be used by charitable organisations, but the boat was hit by a large wave, sank and the crew had to be rescued. “You should now understand at least two things, firstly, Alan is a man who has known disappointment but persists in the face of it, a good lesson for life; there is a difference between endurance and the ability to endure. Secondly, you now know why an expert in sea survival, rather than engineering, is giving this oration. Alan concluded: “What was particularly pleasing about the award, was I was able to share it with so many young people who have their whole future and careers in front of them and their families who have supported them through good times and not so good times.